While everyone may not know the actual play of Doctor Faustus, almost everyone knows of the concept of selling your soul to the devil. That's exactly what Doctor Faustus does in exchange for 24 years of knowledge and power. He has big plans for what he can do as the smartest, most powerful man in the world. He can put the rightful leader back on the throne in Germany. He can protect Germany from invaders. He can cloth all the students at his university in silk. (I wasn't sure what the point of that one was!) He can know all the secrets of the universe. Mephistopheles can be his best buddy. Only as the years go on, that's not exactly what happens. Yes, he has power and knowledge but somehow all the wonderful things he planned to do with it never get done. He ends up using his power of invisibility to play pranks on the Pope. He plays tricks on common people he meets just to vex them. He wants accolades from the aristocracy and so become little more than a party clown for them instead of doing all the wonderful things he believed he would do. Faustus never seems to actually realize that Mephistopheles isn't his best buddy. He seems to think they are just kicking around the world together having a good time. He doesn't seem to believe that in the end, yes indeed, Mephistopheles is going to take him to hell as the agreement they made said he would. Many people throughout the play tell Faustus to repent and ask forgiveness from God but he never does. He seems right on the verge of it at times but never crosses that line. He always backs away from asking forgiveness. At the end, he says that he is too wicked for God to forgive but it comes across as boasting, not regret. 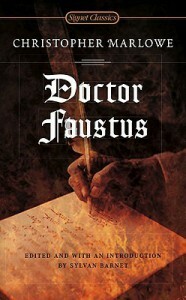 In fact, the whole play seems to be about Faustus' arrogance. This play is set in an interesting time because it's the beginning of the Renaissance and Marlowe was not a Christian and yet, this play seems to be saying that man should not try to grasp higher than his station. That seems to go against what the Renaissance was all about. It's a fascinating play with so much room for thought and interpretation. I thoroughly enjoyed it.